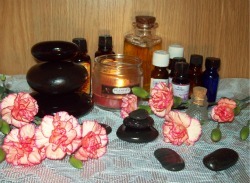 potential list of benefits of aromatherapy using pure essential oils is very long. Synthetic chemical soups that try to reproduce the beneficial effects of pure essential oils are much less effective and potentially harmful in the long run. The average American woman has about 150 chemicals in her body from skin and body care products absorbed through the skin. In this age of buying everything conveniently at the store already made up, we sacrifice in other ways. Take advantage of the wonders of olive oil…, on your skin! Olive oil helps to regenerate and replenish skin. Olive oil has been used for centuries for cooking and skin care. Some of the most popular uses for essential oils involve lavender. Pour some extra virgin olive oil into a fancy little bottle, add a few drops of lavender essence oil and put it on your face morning and night. It goes on oily but in a few minutes it is absorbed, leaving your skin softer. Since I started doing this my skin looks like considerably younger. Lavender oil is also wonderful for burns. It is safe and is worth a try for any skin problem, even insect stings. I apply it at the first sign of a cold sore. The blister never fully develops and goes away very quickly. I carry lavender oil with me in my purse all the time. Lavender is one that can be applied full strength to such things as burns. Essential oils need to be diluted the majority of the time, because full strength is just too strong. Lavender is an exception. Be advised that some people might be allergic to some essential oils, however, just like a perfectly healthy food might be a deadly poison to someone who is allergic to that food. The information below is a summary of some of the uses for essential oils as found in The Complete Book of Essential Oils and Aromatherapy , by Valerie Ann Worwood; and Essential Oils Desk Reference , Essential Science Publishing. Always ask the advice of a physician and check with thoroughly researched reference books for advice before using essential oils. To repel aphids mix 20 drops of any mixture of peppermint, eucalyptus, lemon, lavender, melaleuca, cedarwood, geranium, tansy, rosemary, patchouli in 2 quarts of salt water. Shake and spray on plants. Cockroaches: Mix 10 drops peppermint 5 drops cypress in ½ c salt water and spray where roaches live. Diarrhea? Try a warm bath with four drops of geranium and ginger essential oils each. Then drink this dehydration blend: 1 qt bottled water, 8 tsp sugar, ½ tsp salt, and 8 drops lemon essential oil. If you suspect a mild case of food borne illness massage the body with geranium and lavender. In one tablespoon of vegetable oil blend 5 drops each of geranium and lavender oil and drink the dehydration blend above. Take a bath with 2 drops each of geranium and ginger. A child with fever? Try sponging them down with eucalyptus, peppermint or lavender oil added to the water. Headaches? For general headaches, in 1 teaspoon vegetable oil add 3 drops lavender and one drop of peppermint oil. Massage this around the temples, hairline and base of skull. For tension headache use one drop of chamomile oil instead of peppermint. Insomnia? Use a blend of any of these oils: Chamomile, marjoram, lemon, sandlewood, clary-sage, lavender, orange. Add several drops in a diffuser. In a massage oil base, about 10 drops of essential oils to 1 tsp veg base. Add 10 drops essential oils along with epsoms salts to bath and soak. Toothache? Put 1 drop of clove oil on a cotton ball and apply to the gum around the tooth. Massage onto the jawbone and cheek a mixture of 1 teaspoon of vegetable base oil with a drop of oil of clove, 3 drops chamomile, one drop lemon oil. Below is a concise list of a few popular uses for essential oils. For more thorough information about the uses for essential oils I would recommend one of these books: The Complete Book of Essential Oils and Aromatherapy, by Valerie Ann Worwood; andEssential Oils Desk Reference , Essential Science Publishing. •	People with high blood pressure should avoid sage and rosemary. Again, always ask the advice of a physician and check with thoroughly researched reference books about the uses for essential oils. The remedies mentioned above are for information proposes only. They are not meant to be taken as medical advice and should not be construed to be. Consult a physician if you have a health problem. Please subscribe to or our "What's New" newsletter or to an RSS feed(see left column) to be alerted whenever new information is added to the site.